Friends tell me they don't get the whole blog thing. I agree with them, they don't. Some of these friends are readers, some even read online, but they see blogs as "diaries made public," and certainly there are a lot of those kind of blogs. Some of those I rather like. But others have much more. Some have deep quality writing that moves, inspires, or enlightens us, some have practical information tested in real world settings, and others show us places and images which motivate us to get out into that beautiful world of water and land. 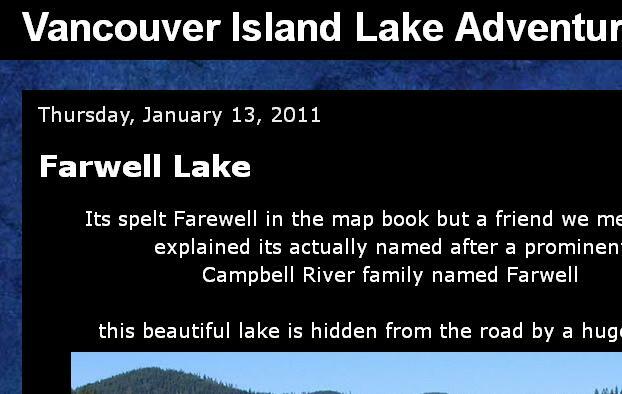 You can see down along the right hand column some of the blogs I recommend for Vancouver Island paddlers and outdoor enthusiasts; and even more off-topic blogs on my profile page. 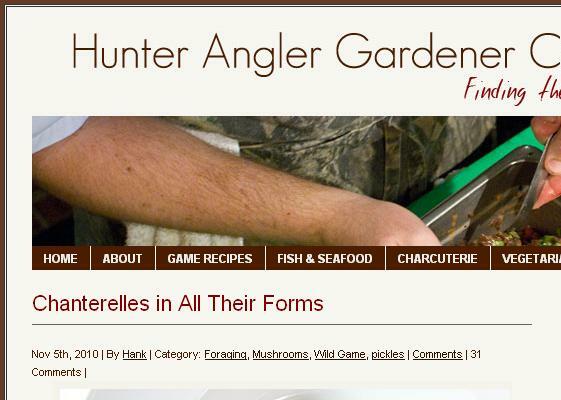 The Outdoor Blogger Network has lots to explore and I have even more over on my Google reader. I can't seem to get enough. Today I'm just going to pick out 5 to highlight because they are unique and striking and I've been meaning to recommend them for awhile. The Heron Dance is an ongoing expression of Roderick MacIver, a nature artist, writer, and canoeist. The Heron Dance's Pause for Beauty blog usually includes a watercolour image as well as a quote from a literary figure, artist, etc. or a reflection from Roderick. The blog is good, but even better is the e-newsletter he puts out by the same name which includes longer writings and opportunities to purchase images and books published by the gang at HD. 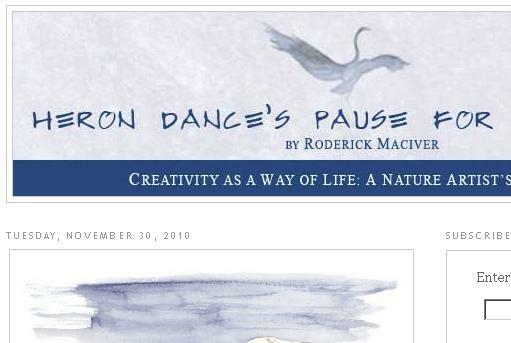 What I like so much about Rod is summarized in the "About Heron Dance" section of the blog. Here is a brief excerpt: "Creative people are above all else people of ideas, and underlying the creation of all art is an iceberg — spirituality, intuition, dreams, perhaps meditation or journaling, a relationship with solitude." Live with that idea for a few minutes! Check it out and subscribe to the newsletter -- his canoeing related entries are top notch. Hank Shaw is an interesting character who looks a bit like me, so maybe that is part of the reason I like his blog. Mr. Shaw's writing is casual, witty, and understated while at the same time communicating valuable information about foraging and cooking wild foods. The photos are from Mr. Shaw's partner, Holly A. Heyser and compliment the writing to such a degree that I'm not sure which I appreciate more. My mouth waters often browsing this blog. Russ Porter and his wife Arlene are livin the life. Their photo-rich travel reports reveal their light-hearted spirit and love of nature. This is one of the best outdoor blogs that focuses on Vancouver Island I have yet seen, and shows just how evocative good photos can be. Check it out. Speaking of photographs -- not many nature photographers can beat Brett Colvin for bringing the outdoors into sharp focus. As a bonus Brett's recent post gives tips on just how he gets some of those amazing shots. If you are a photographer, don't miss this great blog. Scott Schuldt gets out in his Penobscot every few days and writes spare, wonderfully crafted, trip reports full of salient details and observations. I take great pleasure in relaxing into Scott's view and I think you will too. As you can see my taste runs to the thoughtful, the authentic, the well written, and the nature focused. And I havn't even mentioned all the blogs I enjoy, only the ones I think are most germain to readers if 100 Lakes on Vancouver Island. I hope you will take the opportunity in the comment section below to tell me about blogs I might have missed, or should check out, or are new, etc. I look forward to your recommendations! 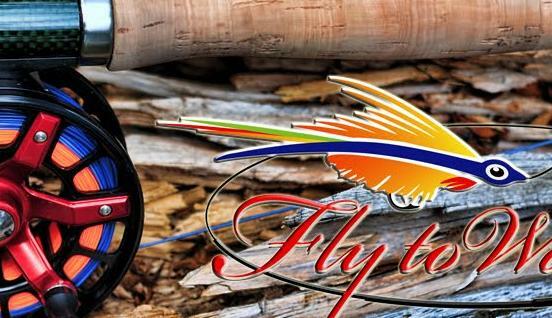 I hope lots of people find your excellent blog and maybe we will see a network of Vancouver Island blogs develop celebrating our super natural outdoor Island beauty. I'm not much of a journal writer and only write the View from the Canoe blog because I thought others might want to know what's going on out there. I've been very glad to find that I have some regular readers. Well Scott, for not being "much of a journal writer" you seem to have pulled off this blog thing fairly well! Richard - the mention and kind words are truely appreciated. I've very much enjoyed your recent posts as well.